When the musicians stand on stage and play, the audience keeps a respectful distance. 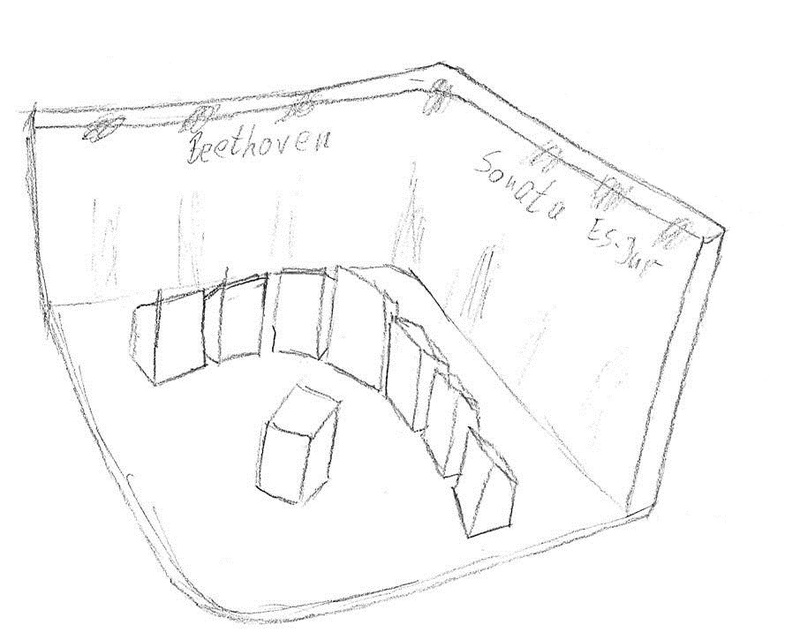 In the installation “Inside Beethoven! The Walkable Ensemble” this is different! While invisible musicians perform, the audience is invited to enter the stage, go to the place of each individual musician and listen at close range. This creates an immersive experience that is otherwise hidden from the audience and reserved for the musicians themselves. The music, its polyphonic structure, the play of each instrument and its contribution to the overall sound suddenly become transparent. Visitors can literally walk through the ensemble, explore and discover major musical works from a totally new perspective. This effect is achieved by an innovative combination of music technology from the cemfi portfolio, exclusive music productions by world-class instrumentalists and sound engineers at University of Music Detmold, and an inviting stage design that turns light and sound into a unique integrated whole. Ludwig van Beethoven’s Septet in E flat major op. 20 is played in the version for wind instruments and strings as well as in its trio incarnation for two solo instruments and piano (op. 38). Digital music desks display the notes played. A marker always indicates where in the score the musicians currently are. From the distance, the music can be heard as the audience is used to. However, if the listener approaches a music stand, and so the position of a musician, he or she enters the sound range of one of the directional loudspeakers, which are mounted above each desk and can only be heard there. What is hears here is an acoustic close-up of the musician. Here are the smallest details audible making the performance of the musician in interaction with his or her ensemble mates plastic. This project is part of the BTHVN 2020 program by the Beethoven Jubiläums Gesellschaft mbH (Beethoven Anniversary Society), a cooperative venture of the Federal Republic of Germany, the State of North Rhine-Westphalia, the Rhine-Sieg District, and the City of Bonn.